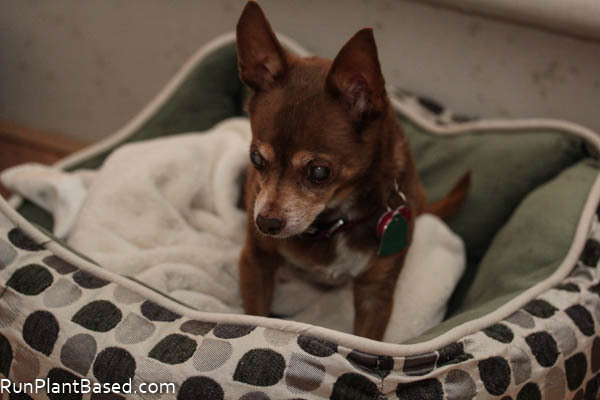 Things are tough for sweet Leela, we think her hearing is going as well as her vision and she wanders around the house more crashing into walls while seemingly not hearing us. She still likes walks when she wants to walk and she loves food, eating is her thing now. Hubby and I have gotten into the habit of picking her up and tucking her into her bed when she seems lost or disoriented in the house. Getting old is tough! 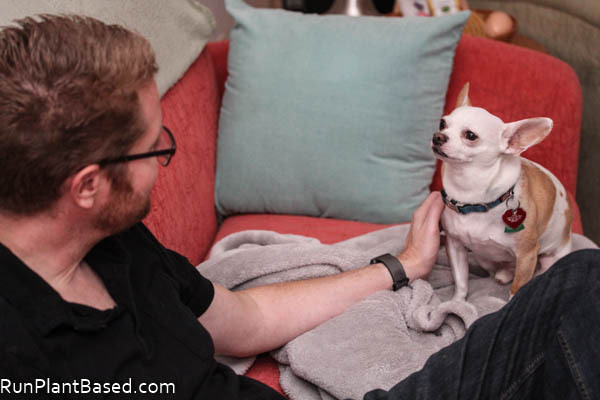 Miko is happy to be a supportive friend and loves his couch time with hubby. He does not love the chilly, wet weather we’re getting this week – I do after many months of dry heat! But enjoying fresh salads can be tough when it’s cold and dark, all I crave sometimes is hot comfort food. This avocado-based dressing helps with its warm and tangy balsamic and Dijon flavors blended with garlic flare. It has the texture of a hearty and creamy comfort sauce with warming zing perfect for salads or steamed veggies. 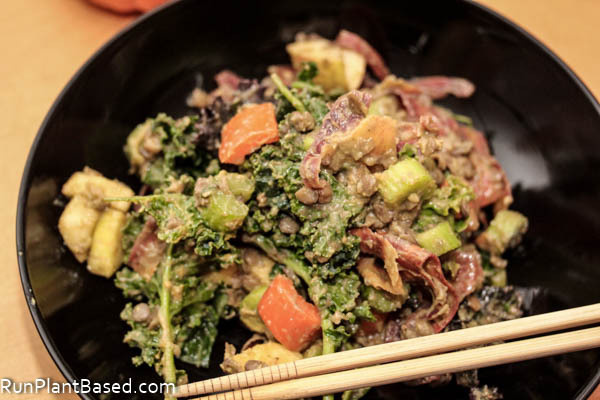 I coated a meal salad with it using lentils I batch cooked earlier this week and colorful rainbow carrots. The texture and flavors worked great with massaged kale countering the slight bitterness with savory creaminess. Making a very filling and hearty winter meal salad. 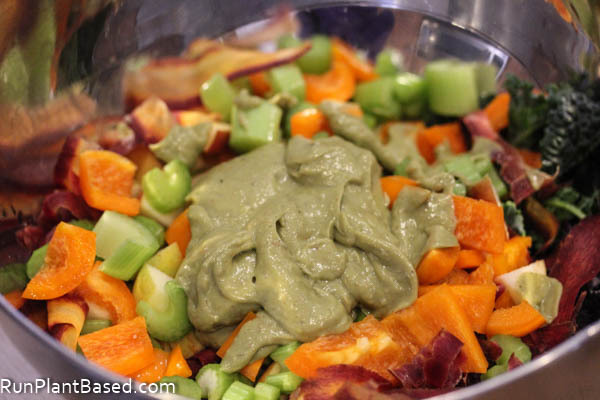 Get in more fresh veggies this winter with this oil and processed-crap free salad dressing. Gosh! I’m so sorry Leela is having a hard time! I’ve been thinking about her a lot lately! Charlie has lost his hearing, too! Paco – everyday is a different thing it seems. At least his nose bleeding hasn’t been an issue lately…knock on wood. It was under 20 degrees this morning…brrrrr! Yes, so difficult to see them age! So sorry about your sweet pups too! Yikes on 20 degrees, stay warm! I usually wouldn’t attempt to combine avocado with balsamic for the color, but you’ve made me realize that I might be missing out on something delicious for a very vain reason. That said, I’m curious to try it with white balsamic, too. Yes, the color can be interesting! Very interesting with white, I’ll have to try that next. 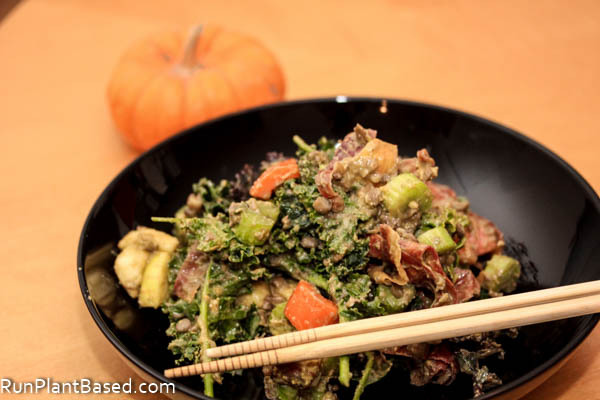 The dressing looks delicious – I have some white balsamic dressing and avocados so I’ll have to give it a whirl! Thanks for the great idea! That dressing sounds divine. Balsamic is my favorite vinegar, and when you add avocado to make it creamy. Just yum! Aw, thanks. It’s so tough watching them age and deal with challenges. I feel bad about not being able to get corrective surgery for her eyes, but it’s too risky for her. Thanks on the dressing and agreed, there is something tangy and warming about it for cooler weather.